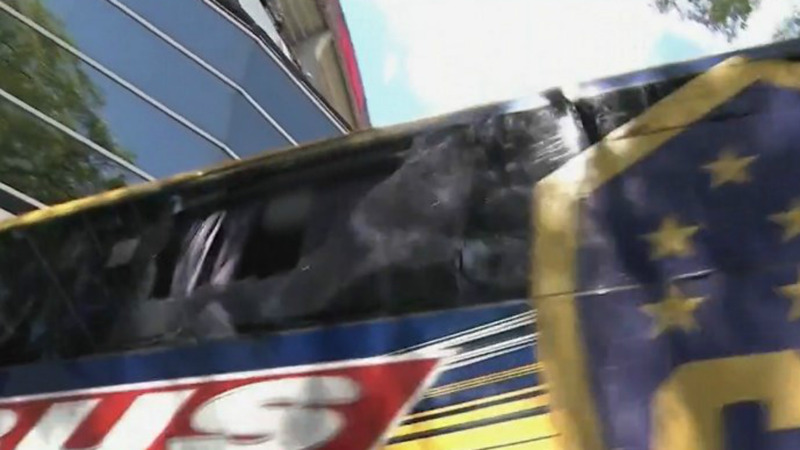 The Copa Libertadores final second leg was suspended in farcical circumstances after Boca Juniors’ team bus was left almost destroyed and two players sent to hospital following an ambush by River Plate fans. The clash between River and Boca at the Monumental looked to go ahead as late as two and a half hours after the original kick-off time, before CONMEBOL finally opted to reschedule amid widespread confusion and conflicting reports. Tensions have been high around the Argentine capital Buenos Aires for weeks since it was confirmed that the two arch-rivals would meet in a two-legged decider. Many, then, were relieved when the opening clash, a 2-2 draw in Boca’s Bombonera, passed off relatively without incident, despite a 24-hour delay due to rain. When Boca’s squad made their way to the Monumental for the return match on Saturday, however, all hell broke loose. Carlos Tevez and his team-mates were greeted by a hail of bottles and other missiles from River fans in the streets surrounding the stadium which shattered the glass of Boca’s coach. Police efforts to disperse the troublemakers only made matters worse, as tear gas fired by authorities made its way through the broken windows and seriously affected the players on the bus. Boca eventually arrived at the Monumental in their half-destroyed vehicle, where several squad members showed signs of injury or sickness related to the serious incidents outside. One of the worst affected was midfielder Pablo Perez, who according was forced to seek medical treatment after being hit in the eye with shards of broken glass. He and fellow Boca player Gonzalo Lamardo were taken to a nearby hospital while inside the Monumental thousands of fans remained in their places, awaiting official confirmation. President Daniel Angelici immediately met with River counterpart Rodolfo D’Onofrio and CONMEBOL chief Alejandro Dominguez to discuss if the game could even be played in such conditions. And when that deadline approached a new delay was confirmed, with the provisional kick-off pushed back to 19:15 local time (22:15 GMT). A subsequent statement filed by the CONMEBOL medical body assured that the Boca team was able to take the field despite the attack, as the two worst-affected players were not in the dressing room to be examined. “Players from the Boca Juniors club suffered light cuts on their legs, arms, faces and abdomens,” the missive read. “Two players alleged injuries in their corneas, which could not be confirmed by our medical body. Both teams, however, were firm in their reluctance to play the game, leading to a stand-off between all concerned parties as the hours tick away in the Monumental. Boca star Carlos Tevez claimed that the Xeneize and River were being “forced to play” the final and that Boca were not in a condition to take the field. “First I want to say to our families that we are alright, most of us are alright, there are three or four injured,” he said to reporters. And after more than three hours of wrangling the final was finally suspended until Sunday at 5pm (8pm GMT), with CONMEBOL now left to decide whether it will be played behind closed doors due to the shocking incidents that tarnished Saturday’s action.